Standard saddle pads require somewhat of a break-in period and learning curve in order to stay in place. But not our stay put pads, they stay right where you want them on the animal, the first time, every time. Our stay put pads were thoroughly field-tested for over two seasons before we decided to offer them for sale. Finally, we decided we couldn't keep them to ourselves any longer. 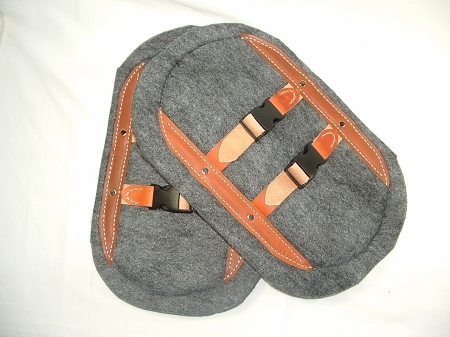 Same 3/4", quality gray felt used in our other saddle pads. Super good looking with top grain leather reinforcements, and easy to use due to acetal buckles.